Saddened today at the news of Film Director John Hughes death, aged only 59. Ferris Beuller’s Day Off is my favourite ‘school’ film and I’ve shown the famous ‘teaching’ clip from this movie hundreds of times all over the world. It always raises a laugh, because he absolutely nailed the single, most absurd problem in education – boring teachers/lecturers, boring people by just talking at them. 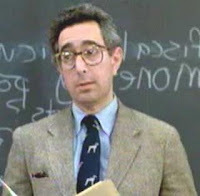 Ben Stein (left), a former teacher, plays the role perfectly. Why my favourite film on education? Well I positively hate the whole private/boarding school thing that has dominated school films in the UK, especially the whole Harry Potter boarding school thing (including the books). It makes me wince when I see adults reading this tosh. I ahve a similar feeling when I see young minds being similarly polluted, but don't those middle-class mums just love this stuff. A tiny number of kids went to these schools, but as our culture is often defined by the people who went to such schools, we get it shoved down our throats. It’s repulsive, unrealistic and divisive. Ferris Beuller showed school as it really is, OK at times, but on the whole rather boring. My other favourite scene from the movie was the long ‘taking attendance’ scene, again played by Stein, "Beuller, Beuller, Beuller....”. It goes on forever. The empty chair said it all. Bunking off school is likely to have been one of the most exciting experiences in a young person’s life. It was thrilling and the freedom exhilarating. That in itself says much about school. An absolute classic - I'm laughing as I recall it in my mind - it's that funny (and stangely touching)! Laughed again at this one! Agree on this. Except the English teachers who made Shakespeare fun, other teachers just came and went filling up the blackboards with things no one understood. The fun part was removing chairs as the kids stood up to greet the teacher and slither to my own seat, to innocently watch the fat kids crash land on floor. So maybe an even deeper/better example of education than you could have hoped for?